One of many 1950s Chinese parades showing support for the communist political movement. The Anti-Rightist Campaign was a reaction against the Hundred Flowers Campaign which had promoted pluralism of expression and criticism of the government, even though initiation of both campaigns was controlled by Chairman Mao and were integrally connected. Going perhaps as far back as the Long March there had been resentment against "rightists" inside the CPC, for example, Zhang Bojun. The first wave of attacks began immediately following the end of the Hundred Flowers movement in July 1957. By the end of the year, 300,000 people had been labeled as rightists, including the writer Ding Ling. Future premier Zhu Rongji, then working in the State Planning Commission, was purged in 1958. Most of the accused were intellectuals. The penalties included informal criticism, hard labor, and in some cases, execution. The second part of the campaign followed the Lushan Conference of July 2 – August 16, 1959. The meeting condemned General Peng Dehuai, who had criticised the Great Leap Forward. After Mao's death, many of the convictions were revoked in 1979. At that time, under leader Deng Xiaoping, the government announced that it needed capitalists' experience to get the country moving economically, and subsequently the guilty verdicts of thousands of counterrevolutionary cases were overturned — affecting many of those accused of rightism and who had been persecuted for that crime the previous twenty two years. This came despite the fact that Deng Xiaoping had been one of the most enthusiastic prosecutors of the movement during the "First Wave" of 1957. 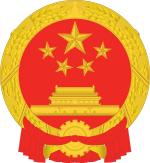 In 2009, leading up the 60th anniversary of the PRC's founding, a number of media outlets in China listed the most significant events of 1957 but downplayed or omitted reference to the Anti-Rightist Movement. Websites were reportedly notified by authorities that the topic of the movement was extremely sensitive. Zhang Bojun, China's "number one rightist"
Luo Longji, China's "number two rightist"
^ a b c "Uneasy silences punctuate 60th anniversary coverage". China Media Project. Archived from the original on 2010-06-11. Retrieved 2009-09-30. ^ Harry Wu; George Vecsey (December 30, 2002). Troublemaker: One Man's Crusade Against China's Cruelty. Times Books. pp. 68–. ISBN 0-8129-6374-1. This page was last edited on 4 March 2019, at 00:18 (UTC).